Some resources on studies on Matthew 16:18, Peter and the Rock, the Papacy, etc. ; linked to over at my other blog, "Apologetics and Agape". Did Luther Think Mary Was Queen of Heaven? Here's one I recently came across on the CARM boards: When did Mary become queen of heaven? After a Lutheran participant admitted Luther could be wrong about believing particular Marian doctrines, a defender of Rome asked, "... have any of the various Lutheran denominations denounced their founder's acknowledgment that Mary is Queen of Heaven?" The assumption put forth is that Luther, his entire life, taught, believed, and was overly explicit that Mary was to be regarded as "Queen of Heaven." As we'll see, this assumption is not supported by the extant documents. The "various Lutheran denominations" have nothing to denounce about Luther using the title "Queen of Heaven" in regard to Mary. Jaroslav Pelikan, ed., Luther’s Works (St. Louis: Concordia) 24:327, cited in Fr. Mateo,Refuting the Attack on Mary (San Diego, CA: Catholic Answers, 1999) p. 67. While I don't plan on purchasing Fr. Mateo's book to check out these secondary citations, both footnotes presented here are erroneous. Both footnotes claim to be to the English edition of Luther's Works. Footnote #1 is actually from LW 21:327 (Luther's exposition of the Magnificat), not LW 24. It's also interesting that the quote from Luther doesn't end at the word "goddess" (as will be explained below). In Footnote #2, LW 36:208 has nothing to do with Mary. LW 45:107 appears to be a botched citation from the Weimar edition of Luther's works. The "empress or a queen" comment is often documented as WA 45, 105, 7 to 106, 1. The quote probably made its way into cyberspace by one of Rome's defenders using Max Thurian, Mary Mother of the Lord, Figure of the Church (London: The Faith Press, 1963), p.80. We'll see with this quote that Luther isn't calling Mary "Queen of Heaven" here. Hail, holy Queen, Mother of mercy, our life, our sweetness, and our hope. To you we cry, the children of Eve; to you we send up our sighs, mourning and weeping in this land of exile. Turn, then, most gracious advocate, your eyes of mercy toward us; lead us home at the beginning and show us the blessed fruit of your womb, Jesus: O clement, O loving, O sweet Virgin Mary. Amen. Queen of Heaven, rejoice, alleluia. The Son whom you merited to bear, alleluia. Has risen, as He said, alleluia. Pray for us to God, alleluia. V. Rejoice and be glad, O Virgin Mary, alleluia. R. For the Lord has truly risen, alleluia. Let us pray. O God, who through the resurrection of your Son Jesus Christ gave rejoicing to the world, grant, we pray, that through his Mother, the Virgin Mary, we may obtain the joy of everlasting life. Through Christ our Lord. Amen. Here I must say a few words about the song which is called Salve Regina. It is a great blaspheme of God. For it says, "Hail you queen of mercy, our life, our sweetness and our hope." Is that not too much? Who could justify calling her our life, sweetness and mercy when she is satisfied to call herself, a "handmaiden of the LORD?" Now people sing that prayer in every corner of the world and also the bells ring out, and still today in nearly every church the Salve Regina is, unfortunately, retained and sung. It is the same with the Regina Coeli, which is not much better, in which she is called the queen of heaven. Is that not doing Christ a disservice when you account to a creature what only belongs to and is proper to God? So forget these ungodly and unchristian words. I will gladly concede that Mary prays for me, but I deny that she must be my comfort and my life. Your prayer on my behalf is also just as precious to me and hers. Why? If you believe that Christ dwells just as much in you as He does her, your prayer can help me just as well as hers. [The Festival Sermons of Martin Luther, 105-106]. In the sermon of March 11, 1523 (yet untranslated in English, documented by William Cole) Luther wants "devotion to Mary" "entirely abolished because of the abuses" (WA 3, 312 ff; cf. Cole, 189). Cole says, "It is quite clear that [Luther] includes the Salve Regina as one of the abuses" (Cole, 189). Cole also documents another sermon (1524, WA 15, 115, 13f) in which "Luther refers to the Salve Regina as blasphemous inasmuch as the name of life and hope is taken away from Christ in favor of Mary and Mary is made into a goddess with her feasts and antiphons" (Cole, 189). Also documented by Cole is that Luther attributes the title "queen of mercy" to the church rather than something which is to be sung about Mary (Cole, 189; LW 12:261). Cole points out though that Luther is not necessarily against calling Mary a "Queen," but that the Roman church had made her into an idol (Cole, 189-190). Mary is "more than an empress or a queen"
"...then on another Feast of the Visitation, July 2.1537, Luther said: 'When the Virgin received the acclamation of Elizabeth as being the blessed Mother of God, because she had believed and because all was coming to pass as the angel had spoken, she was not filled with pride by this praise which no other woman had ever yet spoken to her—this immense praise: "No woman is like unto thee! you are more than an empress or a queen! you are more than Eve or Sarah; blessed above all nobility, wisdom or saintliness!" No, she was not filled with pride by this lofty, excellent and super-abundant praise ...' " [Weimar, 45: 105, 7 to 106, 1]. What's interesting to me is that Luther is not calling Mary the "Queen of Heaven" here, but is rather embellishing the praise given to Mary by Elizabeth, and even Elizabeth (in Luther's words) isn't calling her "Queen of Heaven" but saying Mary is "more than an empress or a queen." It is no valid argument against this to cite the words of the hymn “Regina coeli laetare,” “Whom thou didst merit to bear,” and again, “Whom thou wast worthy to bear.” For the same things are sung about the holy cross, which was a thing of wood and incapable of merit. The words are to be understood in this sense: In order to become the Mother of God, she had to be a woman, a virgin, of the tribe of Judah, and had to believe the angelic message in order to become worthy, as the Scriptures foretold.28 As the wood had no other merit or worthiness than that it was suited to be made into a cross and was appointed by God for that purpose, so her sole worthiness to become the Mother of God lay in her being fit and appointed for it; so that it might be pure grace and not a reward, that we might not take away from God’s grace, worship, and honor by ascribing too great things to her. For it is better to take away too much from her than from the grace of God. Indeed, we cannot take away too much from her, since she was created out of nothing, like all other creatures. But we can easily take away too much from God’s grace, which is a perilous thing to do and not well pleasing to her. It is necessary also to keep within bounds and not make too much of calling her “Queen of Heaven,” which is a true-enough name and yet does not make her a goddess who could grant gifts or render aid, as some suppose when they pray and flee to her rather than to God. She gives nothing, God gives all, as we see in the words that follow. Luther, M. (1999). Luther’s works, vol. 21: The Sermon on the Mount and the Magnificat. (J. J. Pelikan, H. C. Oswald, and H. T. Lehmann, Eds.) (Vol. 21, pp. 327–328). Saint Louis: Concordia Publishing House. 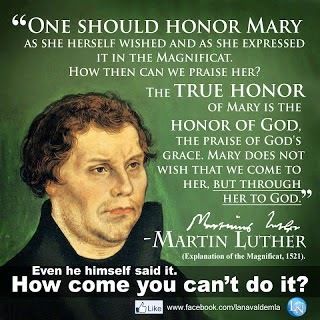 Here Luther allows "Queen of Heaven" to be a "true enough name" but qualifies it that even if this name is applied, Mary is not "a goddess who could grant gifts or render aid, as some suppose when they pray and flee to her rather than to God. She gives nothing." I anticipate this response from a defender of Rome: Yes, Mary is not a goddess. We agree with Luther. Notice though, the Mary of Luther and the Mary of 16th Century Romanism are different, for in that view, Mary is someone to pray to and flee to who grants gifts- hence, what Luther would call, a goddess. According to Luther, by pouring more into the term "Queen of Heaven" (like the defenders of Rome do), "we can easily take away too much from God’s grace, which is a perilous thing to do and not well pleasing to her." In other words, when Luther here says "Queen of Heaven" "is a true enough name," he does not mean the same thing Rome's defenders do. If there's any agreement here between the defenders of Rome and Luther, it's only surface level. Keep in mind as well, Luther's exposition of the Magnificat was seen in his day as an attack against popular Marian piety, and is a transitional work in Luther's Mariology not entirely reflective of his later thought (Roman Catholic scholar Thomas O'Meara, reaches the same conclusion: Mary in Protestant and Catholic Thought, 116-117). In chronological order, Luther's 1521 admitting a use of "Queen of Heaven" is followed by 1522's "doing Christ a disservice" if one uses the title. Then for the rest of Luther's career, the Salve Regina and the Regina Coeli were to be avoided as blasphemous. *I'm indebted here to William Cole's article, Was Luther a Devotee of Mary? Marian Studies XXI (1970), 188-190. Catholic vs Protestant debate on Sola Scriptura - Peter D Williams vs James White - Unbelievable? 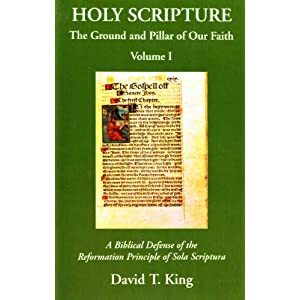 The Protestant Reformation brought forth the cry "Sola Scriptura" - that Christianity should be based on the words of scripture alone, not on Roman Catholic church tradition. Peter D Williams of Catholic Voices argues that the reformers were wrong and that the ultimate authority for Christians rests in the three strands of sacred scripture, sacred teaching and sacred tradition. James White of Alpha and Omega ministries argues that the Catholic church has fallen into error, and that Christians should look to scripture alone for their doctrine. Unbelievable? 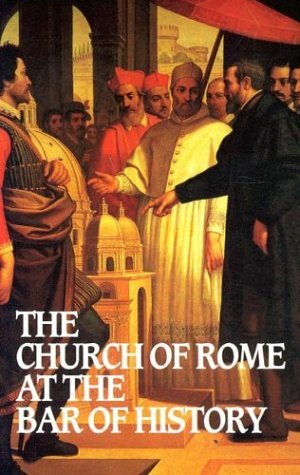 13 October 2012 - Is the Catholic church the one true church? Unbelievable? 18 Sep 2010 - Roman Catholicism - Is the Papacy Biblical? Please pray for Bishop Robert J. Baker, Bishop of Birmingham in Alabama. The Bishop is currently praying for a miracle through the intercession of Venerable Archbishop Fulton Sheen for his health. If you click on this link you will find the official prayer to obtain a favor through the intercession of Sheen in 12 different languages. English: Eternal Father, You alone grant us every blessing in Heaven and on earth, through the redemptive mission of Your Divine Son, Jesus Christ, and by the working of the Holy Spirit. The following is an article that I had almost completely forgotten about. It was originally published in The Outlook October, 2003, and I retrieved it from the archived page from Ntrmin.org. On October 31, churches throughout the world celebrate the nailing of Martin Luther’s Ninety-Five Theses to the Wittenberg Chapel door. The event represents the outpouring of Christianity unshackled and blossoming. Like Hilkiah finding the Book of the Law, the thirty-four year old Luther began to re-proclaim the doctrinal “solas” to the world: scripture alone, Christ alone, grace alone, faith alone, and the recognition that all of life is lived to the glory of God alone. For over five hundred years, these biblical truths reclaimed by the Reformation have transformed individual lives and entire societies. Truly, churches do well to celebrate the victory of the Reformation. But like all victories, we tend to overlook the struggles involved. We may even romanticize the Reformation. We see the triumphs, and think that God blesses particular individuals like Luther with great growth and success, while the rest of us struggle through our Christian lives with failures and hardship. Just ten years after the posting of the Ninety Five Theses, we find the forty-four year old Luther one of the most famous men in Europe. In 1527, he preached sixty sermons, lectured to students, wrote one hundred letters and fifteen tracts, and spent time working on his translation of the Old Testament. He did all this while having the responsibilities of a husband, father, minister, teacher, and political adviser. One can find this productivity throughout all of his life. We think God must have blessed Luther by making his life easier so he could concentrate on God’s work. Some may be surprised to read these words by Luther. How could a man who stood alone against the Catholic Church and Roman Empire show such a lack of faith? My belief is that Luther was like all of us. We at times stand strong, and at other times we cry out to God to increase our faith. Where Luther lacked faith in 1527, he also displayed it remarkably in other instances. The plague ravaged Wittenberg that same year. Many of Luther’s friends died, and his students and colleagues fled for their lives. Luther’s son even became ill for a time. Luther though felt “public servants, preachers, mayors, judges, doctors, policemen, and neighbors of the sick who have no one to take care of them are on duty and must remain.” He did not begrudge those who fled, “for to flee dying and death and to save one’s own life is a natural instinct implanted by God and is not forbidden.” But for Luther, fleeing the plague was not an option. He turned his house into a makeshift hospital, where he and his pregnant wife took care of the dying. The house was quarantined, remaining so even after the plague subsided. And though this world with devils filled should threaten to undo us, We will not fear, for God has willed his truth to triumph through us. The prince of darkness grim? We tremble not for him. His rage we can endure, for lo! His doom is sure. One little word shall fell him. While documentation for this article was not required, I heavily utilized Christian History Magazine, Martin Luther, The Later Years and Legacy (Issue 39), particularly the article The "Weak" Man Behind "A Mighty Fortress" written by Mark Galli, also Heiko Oberman's Luther: Man Between God and the Devil, and Roland Bainton's Here I Stand. In our apologetics and debating; it is helpful to come back to basics, such as prayer, repentance, brokenness over sin, humility. This also reminded me of the fact that the issue of the true meaning of repentance was Luther's very first point in the 95 Theses, against the Roman Catholic emphasis of centuries of "do penance" - doing an external act of dead ritual. These sort of blog entries that claim to be setting the record straight with blatant "honest assessments" are typically one-sided and ahistorical. If put forth by one of Rome's defenders they almost always neglect to apply their own standard to their own church, neglecting the logical conclusion that if one's own argument indicts one's own position, it isn't a valid argument. Typical as well is a selective use of the historical facts leading to negligent historical conclusions. 1. "Luther's Darker Side: the German Peasants"
The first "dark side" that's been hidden from the unsuspecting world is that Luther initially caused the Peasant's War of 1525-1526, that he wrote "an admonition to massacre" "in which he called on everyone to kill the peasants, en masse," he offered "the prospect of martyrdom to those fighting for the aristocracy, but only hellfire for all the slain peasants," and that in all this Luther "had his way" with the eventual slaughtering of 100,00 to 300,000 peasants. The first blatant criticism is that on a basic level, this alleged "darker [part] of Luther's legacy" that is supposed to have been an example of the "whitewashing of the real history of Luther" is a fairly common aspect of Luther's history, found easily and readily in popular Protestant biographies of Luther. In today's explosion of easily accessible information, even a 6th grader utilizing Wikipedia's basic entry on Luther for a book report on the Reformer will uncover this alleged whitewashed dark fact kept hidden away by those wishing to secure the heroic myth of Luther. The Peasants' War did not arise out of any immediate connection with the religious issues of the sixteenth century because agrarian unrest had been brewing for fully a century. Uprisings had occurred all over Europe, but especially in south Germany, where particularly the peasants suffered from changes which ultimately should have ministered to their security and prosperity. Feudal anarchy was being superseded through the consolidation of power. In Spain, England, and France this had taken place on a national scale, but in Germany only on a territorial basis; and in each political unit the princes were endeavoring to integrate the administration with the help of a bureauc- racy of salaried court officials. Third, Shameless Popery mentions that initially Luther called for peace from both the rulers and the peasants, but then took a "new position" that "can fairly be characterized as an admonition to massacre. "* The caricature being presented is that Luther initially wanted peace, but then changed his mind that the peasants should be slaughtered. The historical record though shows Luther wrote Duke John of Saxony July, 1524 and presented the same position he maintained throughout 1525- that ruler's have a right to keep order in society by suppressing revolts. Even in his Admonition to Peace, Luther warned the peasants that societal unrest and anarchy would be met with judgment. Fourth, after quoting Luther's "new position" Shameless Popery (citing Mark U. Edwards) concludes that "Luther had his way" and the "peasants were brutally suppressed." If all that is meant is that societal order was restored by suppressing the peasants, this would be consistent with Luther's thought that rebellion was to be met with force and containment. On the other hand, there is a sense in which Luther did not have his way, because the rulers did not distinguish between the seditious and innocent peasants. Fifth, I think it's ironic that Luther's Roman Catholic critics are so quick to blame Luther for the deaths of peasants, but yet never offer an answer as to why the papacy didn't intervene to protect the peasants, or why they weren't actively working behind the scenes previous to 1525 to better the lives of the peasants. The hard truth appears to me to be that the papacy was content with letting the peasants remain peasants, and whatever their plight was, really wasn't an important issue. On the other hand, once Luther could be linked to the deaths of peasants, the peasants all of sudden became... important members of society that died tragically. Now for hit pieces like that put forth by Shameless Popery, there's never any thought to look into the role of the papacy throughout those periods of history in which the peasants were neglected and downtrodden. This never enters the picture. It's a bit naive though to think somehow a person living in a peaceful country, hundreds of years later, can actually determine the guilt of Luther's writings in the entire peasants revolt. How would Shameless Popery write their criticisms if it was they who lived through 1524-1525? What would they say about the peasants while the peasants ransacked their houses, or killed their family members, and threatening the stability of the land? I would posit many the same defenders of Rome criticizing Luther would be the first to buy his book Against the Robbing and Murdering Mobs of Peasants. It certainly is true that Luther's ideas had an impact upon Germany in the early 1520's, and particularly that the Peasants sought to utilize Luther in their plight. Bainton points out, "...Luther's principles were to his mind perverted and the radicalism of the sectaries contributed to a state of anarchy. Nothing did so much as the Peasants' War to make Luther recoil against a too drastic departure from the pattern of the Middle Ages." If Shameless Popery really desires to put forth an "honest assessment," they should take a simple step back from their myopic view that Luther's theology and fight against Rome caused the Peasants revolt to realizing that oppressed people will utilize anything they can for their cause. Luther was popular and available, so they made use of him. * Shamless Popery states "In May of 1525, he published a work originally titled Against the Rioting Peasants, the title of which was quickly changed to Against the Murderous, Thieving Hordes of Peasants...". I haven't found a reputable source yet to document this change in title. It is quite possible Shameless Popery took this fact from Wikipedia's Against the Murderous, Thieving Hordes of Peasants. They state, "In May 1525, he wrote Against the Rioting Peasants, a title which would be harshened by printers in other cities without Luther’s approval." If this fact was taken from Wikipedia, it's interesting that Shameless Popery didn't mention it was the printers who changed the title. If they didn't take the fact from Wikipedia, I would be interested in further documentation. 2. "Luther's Darker Side: the Jews"
As with the Peasant's Revolt, Shameless Popery appears to think that Luther's anti-Jewish writings and beliefs are secrets kept from the general public. Such is not the case for the same reasons mentioned above. Perhaps though Shameless Popery is more concerned about emphasis- that when people generally tell Luther's story of his battle against Rome they neglect to mention his attitude toward the Jews. 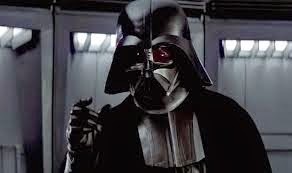 They state, "There's a popular Luther narrative that plays out a little like Star Wars" in which "A humble son of the Church rises up to overthrow the Dark Side, the Evil Empire, the Roman Catholic Church..." This same sort of criticism was lodged by Luther's detractors when the 2003 film Luther was released. Why didn't the movie present the real Luther who hated the Jews? While Hollywood may be a cesspool and manipulates the facts of history, in this instance, along with many who tell the "popular Luther narrative" it's because Luther's anti-Jewish writings come primarily at the end of his life. Even Shameless Popery could've put their own facts together to construct this answer. They mention "One of the last works Luther ever wrote was his 1543 book On the Jews and Their Lies, published just three years before his dead [sic]." When the basic Luther story is told, the major events are from the beginning of his Reformation career, not from his final days in which he wrote scathing attacks not only against the Jews, but Islam and the Papacy as well. Even many good biographies only focus on the first years of Luther’s career up to 1530. The simple and hard truth here is that Luther's stand against the Roman church is the primary highlighted historical fact which Luther is rightly remembered for, while his anti-Jewish statements are facts better suited to the story of medieval Christendom. To tell the story of Luther's negativity towards the Jews is really to tell the story of the Roman church as well as medieval Christianity in their similar negativity towards the Jews. If Luther had a dark side with his negativity towards the Jews, Romanism does as well. If some of Luther's supporters are whitewashing his history on his attitude toward the Jews, some of Rome's defenders do the same for their dark past. For instance similar to Luther, one of the leading Roman Catholic theologians of his day, his nemesis Johann Eck, also wrote some virulent anti-Jewish tracts. Here we find two leading theologians of the Protestant Church and the Roman Catholic Church both engaging in clearly anti-Christian attitudes. How could two of the best minds of the sixteenth century be so wrong and not realize it? Had it just been Luther, perhaps a critic could say: “See the basis of Protestantism is flawed and leads to anti-Semitism.” However, Johann Eck was considered a Roman Catholic theologian of great brilliance (see his entry in the Catholic Encyclopedia). He was respected and revered by the Papacy (and utilized by the Papacy! ), and yet he also attacked the Jews unjustly. Surprisingly, Shameless Popery identifies the world that Luther was part of had "widespread Catholic suspicion and hatred of the Jews," and that "Luther lambasted the Catholic Jew-haters who he accused of both treating the Jews in a subhuman manner, and in driving them from the Gospel." They also rightly point out that Luther did not put forth a biological antisemitism like Hitler, but rather Luther was against Judaism. This doesn't stop Shameless Popery though from putting forth the argumentation of William Shirer. Here they put their facts together and conclude, "...anti-Judaism predates Luther. That said, it is undeniable that Luther recognized the dangers of this hatred of the Jews, and yet fueled the fires nonetheless." It's a situation in which Luther knew better, but went ahead in hatred anyway. In actuality, As Gordon Rupp pointed out, even the early Luther thought that humanly speaking, the Jews were nonconvertible and could not be saved by human action, and, because they reproach God and blasphemed against Christ their faith is an actively anti-Christian religion [see: Gordon Rupp, Martin Luther and the Jews (London: The Council of Christians and Jews, 1972), 9] . The final section of this hit piece delves into why the Peasants' Revolt and Luther's anti-Jewish writings matter. They are said to serve as examples of Luther's "sin of pride." With the peasants, Luther was gentle with them until they disagreed with him. With the Jews, when he thought the Gospel would be accepted by them, he was nice to them, when they didn't convert, he turned on them. Luther's pride was that he alone considered himself right, and everyone else wrong. As noted above though, Luther's position towards the peasants was consistent throughout- civil unrest was not to be tolerated and those disrupting society faced dire consequences. The change for Luther is in tone based on circumstances, not in theory. With Luther's attitude toward the Jews, it's true that Luther was disappointed that they still rejected the Gospel once it was unshackled from Rome. On the other hand, this was not the only reason, and his blatant anti-Judaism took years to develop (see my paper here). Luther had no objections to integrating converted Jews into Christian society, but he maintained a lifelong intolerance of Judaism. When Catholics point out that several of Luther's early writings sound pretty Catholic, the standard Protestant response (and a quite reasonable one, I might add), is that Luther wasn't completely reformed yet. Even after he went into schism, he spent another quarter-century slowly divesting himself of his Catholic beliefs. But what's remarkable is that, as Luther became less and less Catholic, he became less and less Christian. So based on two historical caricatures presented by Shameless Popery, it is concluded that Luther became less Christian. Here's an obvious tip off that they've never read many (or any) of Luther's sermons. In Luther's sermons one is confronted with his deep theology and piety, which was consistent throughout his life. He always preached Christ, and he always exhorted his hearers to a life of being conformed to the image of Christ. Shameless Popery though gravitates to Luther's later polemical writings, which are only one aspect of his writing output, as the epitome of his thought. Here's a tip off as well that only certain facts will fit their paradigm. It would be interesting to know where they think the year 1527 fits (it's after the peasants' war). In 1527 the plague ravaged Wittenberg. Many of Luther’s friends died, and his students and colleagues fled for their lives. Luther’s son even became ill for a time. Luther though felt “public servants, preachers, mayors, judges, doctors, policemen, and neighbors of the sick who have no one to take care of them are on duty and must remain.” He did not begrudge those who fled, “for to flee dying and death and to save one’s own life is a natural instinct implanted by God and is not forbidden.” But for Luther, fleeing the plague was not an option. He turned his house into a makeshift hospital, where he and his pregnant wife took care of the dying. The house was quarantined, remaining so even after the plague subsided. Well, maybe he was still too Roman Catholic at this time. Or the years after that (up until his death) when Luther was quite ill, but still managed to fulfill he duties as a preacher and husband- perhaps he was still too Roman Catholic. Or, where does 1541 fit in when the Luther's took in a transient woman and cared for her, only to find out she lied to them and stole from them, "Yet Luther believed no one would become poor by practicing charity"? 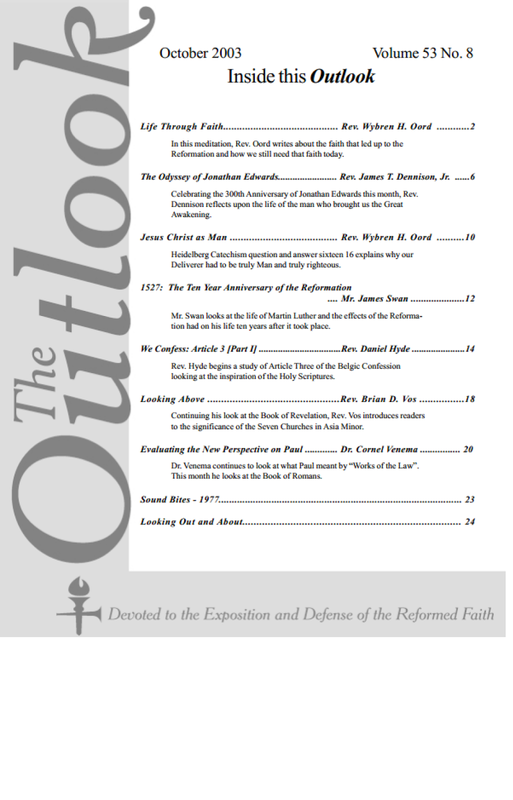 (Christian History Issue 39 Vol. XII, No. 3, 1993, pp. 2-3). Many more examples like these could be given. When it comes right down to it, Shameless Popery appears to not have done any actual historical study to make such an absurd conclusion. Within the same year, 1525, he both cautiously encouraged the peasant's revolt as possibly of God, and called for everyone involved in the revolt to be killed, saying that they were all going to hell. 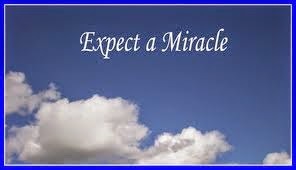 Does that sound like someone being led by the Holy Spirit, or like those that St. Paul warns (Eph. 4:14) are “tossed to and fro and carried about with every wind of doctrine, by the cunning of men, by their craftiness in deceitful wiles”? I understand that even Saints make mistakes, and that even Saints sin. I get that, really. Nobody is expecting that Luther be perfect. But it does seem to me that there's a far cry from that platitude to saying that the guy who goes to his grave crying out for mass murder is a Saint. Second, it is easy to prove that you are taking God’s name in vain and putting it to shame; nor is there any doubt that you will, in the end, encounter all misfortune, unless God is not true. For here is God’s word, spoken through the mouth of Christ, “All who take the sword will perish by the sword” [Matt. 26:52]. That means nothing else than that no one, by his own violence, shall arrogate authority to himself; but as Paul says, “Let every person be subject to the governing authorities with fear and reverence” [Rom. 13:1]. How can you get around these passages and laws of God when you boast that you are acting according to divine law, and yet take the sword in your own hands, and revolt against “the governing authorities that are instituted by God?” Do you think that Paul’s judgment in Romans 13 [:2] will not strike you, “He who resists the authorities will incur judgment”? You take God’s name in vain when you pretend to be seeking divine right, and under the pretense of his name work contrary to divine right. Be careful, dear sirs. It will not turn out that way in the end. [Luther, M. (1999). Luther’s works, vol. 46: The Christian in Society III. (J. J. Pelikan, H. C. Oswald, and H. T. Lehmann, Eds.) (Vol. 46, pp. 24–25). Philadelphia: Fortress Press]. In conclusion Shameless Popery states, "So these are the reasons that I raise these unpleasant bits of history. In doing so, I hope that I've been fair to Luther, while raising questions worthy of serious examination." Based on their treatment of two historical situations from Luther's life and concluding "Luther became less and less Catholic, he became less and less Christian," I find that Luther hasn't been treated fairly at all. I could just as easily point out the Council of Florence, held "those not living within the Catholic Church, not only pagans, but also Jews and heretics and schismatics cannot become participants in eternal life, but will depart 'into everlasting fire which was prepared for the devil and his angels,'" and then later the Catholic Catechism stated, "The plan of salvation also includes those who acknowledge the Creator, in the first place amongst whom are the Muslims, to the Pope in 2000 stating, "All who seek God with a sincere heart, including those who do not know Christ and his Church, contribute under the influence of grace to the building of this Kingdom." The further the Roman church moves away from the teaching of the Bible, the less and less she is Christian. When they conclude "he became crueler and more bloodthirsty, the longer he spent away from the Church" this is from someone whose church has actually taken part in cruelty and the spilling of blood. If there's a consistent argument from a Roman Catholic against Luther out there, "The Dark Side of Martin Luther" is nowhere near it. Frankly, I'll stick with Risk. This is not a video game but rather an old-school board game... Just in time for Christmas, this game is a steal for a mere $110.14 at Amazon. 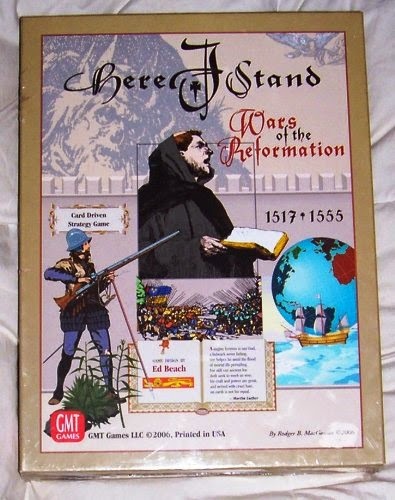 Here I Stand" from GMT Games, is a monster of game that recreates the political, military, and religious struggle of the mid-16th century. Players take on the roles of Britain, France, the Catholic Church, the Protestant Rebellion, the Turks, or the Hapsburgs. "Here I Stand" takes its title from Martin Luther's statement during the Diet of Worms in 1521. When Luther was ordered to recant his writings he said, "Here I stand. I can do no other." The Game is card driven, where players can play cards for their historical events or for their point values. It is a similar system to GMT's "Twilight Struggle," "1989: Dawn of Freedom," and "Washington's War." This is a much, much bigger game however. Though the game only lasts nine turns, however, the details and nuance of each phase ensure this can easily be a 8-9 gaming experience. Still, players who devote the time to it will find a brilliant game that captures the flavor of the period, and yet still lets players engage in creating ahistorical timelines. The Hapsburg and French player essentially engage in a military conflict, while the Catholic and Protestant player duke it out in a series of religious debates with Germany as the prize. The English and Turkish players must expertly navigate the fringes of Europe and look for opportunities to advance their cause. Each player has unique victory conditions. "Here I Stand" is truly a wonderful game that expertly blends play mechanics with its historical theme. The only downside is its length, meaning that it won't hit the table as much as I'd like. If you do enjoy a good historical scenario that is rich in detail and engaging theme, you'll want to look into "Here I Stand." Mark Brumley wrote a fascinating article, Why Catholicism Makes Protestantism Tick: Louis Bouyer on the Reformation. 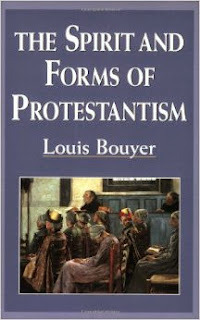 The article is an overview of Louis Bouyer's book, The Spirit and Forms of Protestantism. I think it will [be] interesting to discuss some of the ideas drawn from that article and book. What a breath of fresh air on the Catholic Answers forums to find someone recommending one of the authors typically viewed as part of the Roman Catholic reassessment movement (Louis Bouyer). Roman Catholic scholarship previous to say, 1917 or so, held Luther in very low regard and typically (but not entirely) attacked Luther the person rather than Luther the honest theologian. Louis Bouyer belonged to a generation of Roman Catholic scholarship that attempted to go beyond entirely negative polemics. I like how Mr. Brumley described Bouyer's book: "it avoids the bitter anti-Protestantism that sometimes afflicted pre-conciliar Catholic works on Protestantism." Indeed. Probably half of the squabbles I've had with Roman Catholics come from them utilizing Roman Catholic studies from the period before the Roman Catholic reassessment movement (Grisar, Denifle, O'Hare, etc). Had they moved beyond these outdated works into more current Roman Catholic Luther scholarship (Lortz, Wicks, McSorley, etc. ), I think the conversations would have been less hostile and more fruitful. Before anyone thinks Bouyer is presenting a kumbaya treatment of the Reformation, he is critical of Protestantism and sees Luther as distorting the Roman Catholicism. One fairly famous quote from the book is that "...it was Luther himself, and not only the stupidity of his followers, who provided all the elements of the system which was to imprison, rather than protect, the original doctrine" (p. 166 1956 edition). Luther's basic intuition, on which Protestantism continuously draws for its abiding vitality, so far from being hard to reconcile with Catholic tradition, or inconsistent with the teaching of the Apostles, was a return to the clearest elements of their teaching, and in the most direct line of that tradition. Now this sort of statement being made at Catholic Answers is akin to giving the store away. Think of all the discussions and debate over sola fide and sola scriptura that have occurred at Catholic Answers... and now a Roman Catholic theologian is saying these things were a return to the clearest elements of the teachings of the apostles? 1. Sola Gratia. What was the Reformation's main principle? Not, as many Catholics and even some Protestants think, "private judgment" in religion. According to Bouyer, "the true fundamental principle of Protestantism is the gratuitousness of salvation"–sola gratia. He writes, "In the view of Luther, as well as of all those faithful to his essential teaching, man without grace can, strictly speaking, do nothing of the slightest value for salvation. He can neither dispose himself for it, nor work for it in any independent fashion. Even his acceptance of grace is the work of grace. To Luther and his authentic followers, justifying faith . . . is quite certainly, the first and most fundamental grace." Bouyer then shows how, contrary to what many Protestants and some Catholics think, salvation sola gratia is also Catholic teaching. He underscores the point to any Catholics who might think otherwise: "If, then, any Catholic–and there would seem to be many such these days–whose first impulse is to reject the idea that man, without grace, can do nothing towards his salvation, that he cannot even accept the grace offered except by a previous grace, that the very faith which acknowledges the need of grace is a purely gratuitous gift, he would do well to attend closely to the texts we are about to quote." In other words, "Listen up, Catholics! The link goes on to point out that Roman Catholics can claim sola gratia because even after initial grace given, the subsequent works that are done are based on continued grace. This is what Roman Catholics understand by the sufficiency of grace: "Our salvation requires that we assert and believe that, in every good work we do, it is not we who have the initiative, aided, subsequently, by the mercy of God, but that he begins by inspiring faith and love towards him, without any prior merit of ours," and "Man freely cooperates in salvation, but his free cooperation is itself the result of grace. Precisely how this is so is mysterious, and the Church has not settled on a particular theological explanation"(Brumley). 1. The issue is whether grace, by itself accomplishes salvation. Trent said the grace of justification can be gained and lost. Therefore if someone doesn't perform works done in a state of grace, justification can be lost. In the final analysis, the deciding factor as to whether or not someone is eternally justified is decided upon someone's will. This means that something else (human decision) must be attached to God's grace, hence gratia is not completely sola. When I as a Protestant say, sola gratia, I really mean sola. God's grace is the ultimate deciding factor of who will believe, and who will continue to believe. 2. It isn't any sort of failure on my part to choose to perform works in a state of grace that leads to my eventual salvation or damnation. Rather, the perfect works of Christ are mine now, given to me graciously and eternally. The good works I do now are the fruits and signs of justification, they are not the means to increase my justification. I've been given Christ's works by grace alone. Bouyer also sees a negative principle that the Reformation unnecessarily associated with sola Scriptura or the sovereignty of the Bible. Yes, the Bible alone is the Word of God in the sense that only the Bible is divinely inspired. And yes the Bible’s authority is supreme in the sense that neither the Church nor the Church’s Tradition "trumps" Scripture. But that doesn’t mean that the Word of God in an authoritative form is found only in the Bible, for the Word of God can be communicated in a non-inspired, yet authoritative form as well. Nor does it mean that there can be no authoritative interpreter of the Bible (the Magisterium) or authoritative interpretation of biblical doctrine (Tradition). Repudiation of the Church’s authority and Tradition simply doesn’t follow from the premise of Scripture’s supremacy as the inspired Word of God. Furthermore, the Tradition and authority of the Church are required to determine the canon of the Bible. The debate, as I understand it, is that the Roman Catholic side finds the "Word of God" in another form besides Scripture (Tradition, the Magisterium). The article presents a particular speculative view that "the Word of God can be communicated in a non-inspired, yet authoritative form as well," and if this is taken into consideration by the Protestant side, the rift over sola scriptura could be healed. My concern is whether or not the article wants to go so far and say infallible Tradition is not divinely inspired. If so, they've set up a situation in which Tradition (and any infallible pronouncement from the Magisterium) is infallible but not divinely inspired. See my discussion here for more on this. If the infallible Word of God is found elsewhere beyond the Scriptures (say, in Tradition or the Magisterium), scriptura is not sola.